According to Vasavada, the problem appeared Saturday night in the rover’s main computer. The issue means that Curiosity can’t properly store or send data it collects from its science instruments. The rover is still able to transmit some data, including about its well-being. It can uplink information to a Mars orbiter as it passes overhead, or beam it directly to the Deep Space Network, a series of antenna back on Earth. Vasavada said engineers have instructed Curiosity to send more data about its status, which doesn’t require the rover to dip into previously stored information. If needed, engineers will switch operations over from the main computer to a backup computer. That backup computer actually used to be the rover’s primary system, but it experienced a couple of technical glitches of its own in 2013. Those were eventually fixed, so engineers could make a switch again. Curiosity arrived on Mars six years ago to explore the composition of the rocky terrain and perhaps find organic compounds. The rover travels at the very unhurried pace of less than mile per hour and stops every now and then to burrow its drilling equipment into the ground. This week, Curiosity tried to drill in a new location, but couldn’t penetrate the rock more than a few millimeters. “Who’d have thought that ridge rocks could be so hard?” a blog post from the rover’s science team reported. Curiosity drove off, bound for a new drilling target. Then the mysterious glitch emerged. The situation doesn’t sound as dire as the one Opportunity is in. But the news will no doubt be painful for the scientists and engineers involved, for whom the rovers are more than just an amalgamation of metal and wires. They have formed strong emotional attachments to both rovers over the years, and that bond has been on full display recently. Last month, NASA officials announced plans for rescue attempts for Opportunity. The dust of the storm had settled and sunlight was peeking through the atmosphere, which meant that Opportunity would soon—if it could—wake up. Officials said they would spend 45 days actively listening for signals from the rover, after which it would need to think seriously about letting go. The response from former and current members of the mission was fierce. They criticized the plan as arbitrary, the timeframe as too short. There was “a lot of anger, some sadness, some shock” among members of the team, one employee said. They weren’t ready to give up on Opportunity. 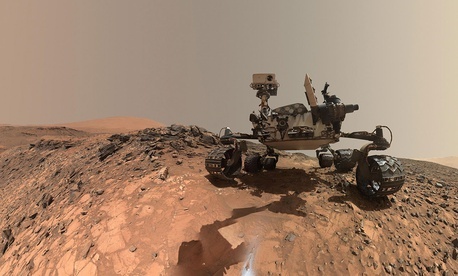 If Curiosity’s situation worsens, the rover will be met with the same protectiveness. Humans have a tendency to anthropomorphize robots, even if they’re millions of miles away. Research has shown that the more “alive” a robot appears, the more likely people are to react to it the way they would with living beings. For fans of Opportunity and Curiosity, the rovers are quite alive: They move around, they take selfies, they have names. And, as we’ve learned this year, they can get sick and, perhaps, die.